tedox KG, Bovenden-Harste, Germany | itelligence, a.s.
With it.x-EDIconnect, itelligence AG provides us with the ability to implement requirements relating to electronic data interchange in a quick and functional way. For example, we were able to integrate our import company in the EDI processes at very short notice. The support from itelligence enabled the internal requirements involved in import and export processing to be implemented in an outstanding way. 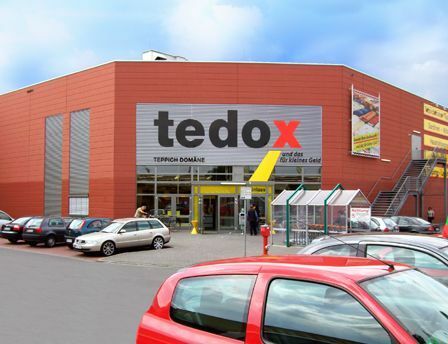 tedox KG is a retail company which calls itself as “renovation discounter”. What’s unique for tedox is, that the company doesn’t need any advertising, the retailer just relies on word of mouth. At tedox customers find nearly all products they need for their houses’ interior designs. tedox’s more than 2,600 employees generate annual sales of about EUR 450 million. Read more about how tedox KG managed to connect with a large number of business partners more efficiently thanks to the itelligence solution it.x-EDIconnect. tedox is unique in many respects. For example, this family company can look back on a success story that has continued for several decades. And customers can find almost everything they need for their homes. Advertising? Not at tedox, because the company relies just on word of mouth. That’s possible only as a result of a high-quality service. The key to this lies in flawless communication. In order to maintain the professional implementation of its electronic data interchange in the future, tedox decided to replace its existing solution with it.x-EDIconnect from itelligence. tedox is in daily contact with hundreds of merchants and suppliers in Germany and abroad. Countless purchase orders, invoices, delivery receipts, and supplier requests are generated in this process. With the support of it.x-EDIconnect, this communication becomes transparent and simple, as all file formats that are common in the industry, such as VDA and EDIFACT, are supported. In order to not lose track of the completely automated EDI communications, it.x-EDIconnect includes optimized functional monitoring. Search options specifying a document, for example by order or article number, simplify business processes and make the operations conducted by tedox staff easier. Hand in hand with that, the monitoring process is optimized as a result of the explicit information search. The technical monitoring offers an overview in table form of all ongoing processes at all times, so that incorrect processes are automatically repeated after they have been corrected. it.x-EDIconnect provides purchasers, suppliers, and logistics companies with seamless exchange of data within their network and along the supply chain. As it.x-EDIconnect is controlled via the browser, the solution is moreover very user-friendly. What’s more, intuitive administration, configuration, and monitoring screens support the IT department at tedox in its work. it.x-EDIconnect has been adapted to tedox’s individual EDI requirements and yet can still be flexibly expanded. Orders and invoices can be sent and received fully automatically using a direct ERP connection. So tedox enjoys a state-of-the-art set-up and is also ideally placed for the future. The progress of the project benefited from the especially good cooperation between the itelligence experts and the tedox staff. The installation was completed and the data migration successfully started after just 6 weeks. SAP ERP forms the strategic platform that merges and standardises all structures, processes and value flows of the Winkhaus Group. The it.mobile SalesKit app from itelligence AG, which had previously introduced a new ERP system at four company locations, provides a modern user interface for structuring and presenting content. The SalesKit app’s integrated role concept also supports structured content management.